Roman Catholics Seth Lundy (right) goes around Bonner-Prendergasts Ajiri Johnson in a Catholic League game last season. 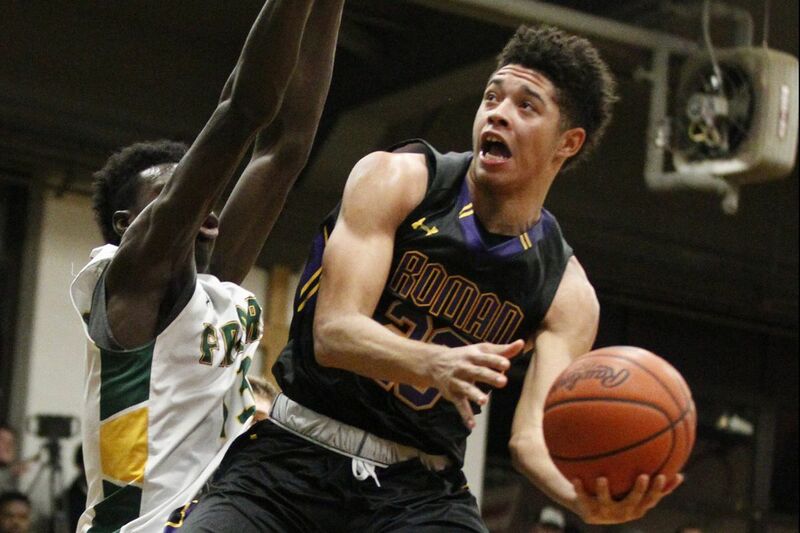 Roman Catholic has captured 30 Catholic League basketball championships, including two of the last three. Bonner-Prendergast, meanwhile, last claimed the first-place hardware 30 years ago. The Cahillites look to add to their already crammed trophy case at Broad and Vine Streets, and the Friars seek to end a lengthy drought when the teams square off for the crown at 8:30 p.m. Monday at the Palestra. On the girls' side, defending champion Cardinal O'Hara takes on Neumann-Goretti for top honors at the hallowed arena at 6:30 p.m.
After an eight-year dry spell, Roman won back-to-back titles in 2015 and 2016. It is making its seventh appearance in the final in the last 13 years. In the teams' regular-season meeting six weeks ago, the visiting Friars nipped the Cahillites, 68-66, in overtime. Matt Griffin's squad is paced by 6-foot-6 junior wing Seth Lundy, sophomore point guard Lynn Greer, 6-3 senior guard Allen Betrand, and 6-5 junior forward Hakim Hart. Bonner-Prendie counters with a lineup headed by dynamic junior guard Isaiah Wong, 6-8 senior center Ajiri Johnson, 6-9 junior forward Tariq Ingraham, and junior wing guard Mike Perretta. Lundy and Greer average 16.2 and 15.6 points, respectively. Betrand, a Towson recruit, and Hart both average 13.7 points. Wong, the Catholic League's most valuable player, averages 21.6 points. He racked up 32 points, 15 rebounds, and nine assists in a quarterfinal win over Cardinal O'Hara. With the high-leaping Betrand producing 12 of his 20 points in the fourth quarter and blocking five shots, Roman (19-5) held off St. Joseph's Prep, 69-66, in Wednesday's semifinal. With Wong and Ingraham each scoring 10 points and grabbing nine boards, Bonner-Prendie (22-3) reached the final with a 48-45 triumph over Archbishop Carroll. Johnson chipped in nine caroms and eight points. Roman has to make sure Wong doesn't take over the game; limit the second-chance opportunities for Johnson and Ingraham; and closely defend Perretta's three-point attempts. Bonner-Prendie has to keep the versatile Lundy from flourishing inside and outside; Jack Concannon's group must also quickly close the lane when Greer tries to get to the rim; and view Betrand and/or Hart as potential X-factors. O'Hara (19-4) is aiming for its second straight Catholic League title and 11th in the last 21 years. Neumann-Goretti (17-5) is trying to earn gold for the third time in five seasons. Cardinal O’Hara senior guard and Villanova recruit Mackenzie Gardler. The Lions, guided by longtime coach Linus McGinty, bested Archbishop Wood, 39-35, in a semifinal. They have a strong one-two punch in 5-10 Maura Hendrixson, a Drexel recruit, and fellow senior guard Mackenzie Gardler (Villanova). The Saints escaped Archbishop Carroll, 48-47, in a semifinal that was decided by Tatiana Jones' trey with five seconds remaining. It marked the 100th career victory for Andrea Peterson, a 2004 Carroll graduate. Neumann-Goretti’s Jabria Ingram, left, will continue her career at Hartford. Neumann-Goretti's headliner is Jabria Ingram, a 5-8 senior who averages about 17 points and is bound for Hartford. Support comes from Jones, a 6-foot junior forward, 5-11 senior forward Daijah Parmley, and junior guard Kiara Kroger. Also in the mix for O'Hara are senior guard and lockdown defender Molly Paolino, 5-9 sophomore forward Stephanie Huseby, junior wing Kerry Patterson, and 5-8 junior forward Erin Welde. Behind 20 points from Ingram and 10 from Jones, the Saints bested the Lions, 47-42, in the teams' regular-season meeting. O'Hara was paced by Gardler's 23 points.